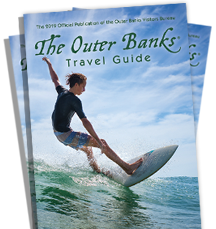 For many, the thought of a vacation to North Carolina’s Outer Banks sounds relaxing and fun-filled. The area is well known for its abundance of vacation rentals and hotel options. However, for some budget-challenged families, those options can take their toll on the wallet. But there’s another option that could be the perfect compromise: camping. 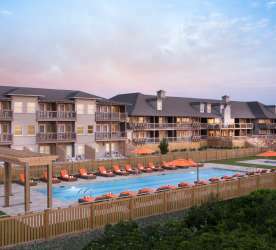 The Outer Banks is a compelling destination for camping families looking for a cost-effective experience in a vibrant, family-friendly atmosphere. “My childhood memories of summer vacations center on the weeks spent with family along sandy beaches and coastal waters: lazy days of sandcastle building, shell collecting, pier walking, and sunrise strolling,” said Kristin Chapman, who runs the blog TheTouringCamper.com, along with her husband Jarrett. “I was eager to share these fond experiences with my own growing family, but I needed a way to entice my sand-avoiding and camping-inclined husband to spend a week at the beach. 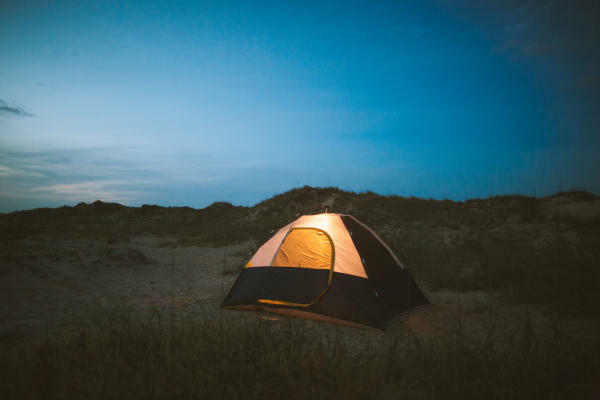 Our camping trip to the Outer Banks was the perfect compromise.” Coastal camping in the Outer Banks can provide an opportunity for a cost-effective vacation, combining sand, sun and a variety of family-friendly attractions. Scattered along the 130-mile stretch of barrier islands, the Outer Banks features a plethora of public and private campgrounds. Budget-conscious families will find camping in the Outer Banks offers all the benefits of the region, without breaking the budget. Nightly or weekly rates at campgrounds are competitively priced, and compared to a beach house or condo rentals, booking a campsite can save vacationers hundreds to thousands of dollars. Visiting the region in the off-season months of March-May and September-November will net camping families even greater savings. 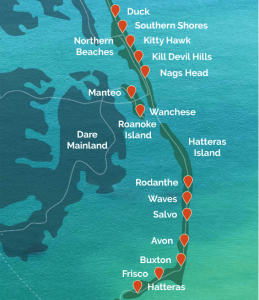 The four private campgrounds along the Northern Beaches - which includes Duck, Southern Shores, Kitty Hawk, Kill Devil Hills and Nags Head - provide a host of shopping, dining and sightseeing experiences. The National Park Service has reservable campsites at Oregon Inlet, which is not far from the historic Bodie Island Lighthouse in the Cape Hatteras National Seashore. From base camp, it is a short walk to the path where the Wright brothers’ historic first flights took place. Kitty Hawk Kites offers a great variety of unique, new kites to fly from atop Jockey’s Ridge State Park, the largest natural living sand dune on the East Coast. For shoppers, the Tanger Outlets, local boutiques, and artsy shops are located along the main drag. At Jennette’s Pier in Nags Head, novice or experienced anglers can cast a line off the 1,000-foot public fishing pier. The friendly staff oversees a variety of educational programs for those new to fishing, even including a step-by-step guide to preparing and cooking the catch of the day. ​Across the bridge on Roanoke Island, in Manteo and Wanchese, camping options are more limited. Other options within a short drive to this area include sites along the southern end of the Northern Beaches or the northern end of Hatteras Island. Like the rest of the region, Roanoke Island is rich with history and natural beauty and offers a variety of touring possibilities. At the North Carolina Aquarium, families can explore coastal Carolina’s aquatic environments and sign up for a special tour of the Sea Turtle Assistance and Rehabilitation Center. A visit to Roanoke Island Festival Park transports vacationers back to 1585 through hands-on exhibits highlighting the region’s early history. Other possibilities include a visit to the Fort Raleigh National Historic Site, walking the Elizabethan Gardens, attending “The Lost Colony” outdoor drama, or learning more about the area’s wildlife at the National Wildlife Refuges Visitor Center. 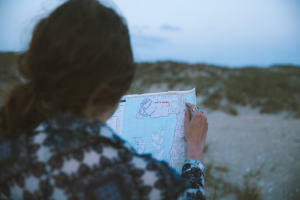 Selecting a campground in the central to the southern half of the Outer Banks, which encompasses Rodanthe, Waves, Salvo, Avon, Buxton, Frisco, and Hatteras, provides a slower pace and campgrounds away from the hustle and bustle. In Rodanthe, fourteen private campgrounds are centrally located about 30 minutes away from the northern and southern regions of the Outer Banks, on both the beach and the sound side of Hatteras Island. The National Park Service has reservable campsites at the Frisco Campground, and sites at the Cape Point Campground are available on a first-come, first-serve basis. Sunrises can be spotted daily when camping on sites with beachside access, while sound-side sites can offer spectacular sunsets. On the northern end of Hatteras Island, it is just a short drive to bird watching at Pea Island National Wildlife Refuge, and the Chicamacomico Life-Saving Station is a great place to learn about the country’s pre-Coast Guard days. Along the southern end of Hatteras Island, the iconic Cape Hatteras Lighthouse can be climbed, and information about shipwrecks on the Outer Banks can be heard at the Graveyard of the Atlantic Museum. From Hatteras, it’s a quick ferry ride to Ocracoke Island, where regular tours are held at grounds of North Carolina’s oldest operating lighthouse. 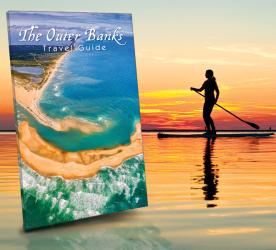 The Outer Banks is a destination that offers something for everyone. 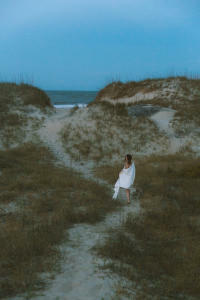 Whether vacationers spend the week sitting on the beach or exploring the region (or a mix of both), even sand-reluctant vacationers may discover a whole host of memorable moments while camping in the Outer Banks.